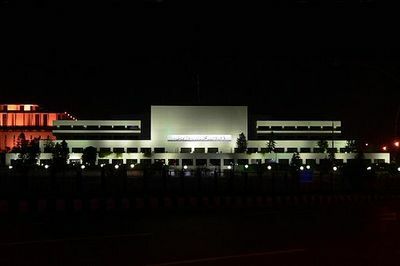 Pakistan Parliament House, Islamabad – Photograph 2006 Via Wikimedia Commons. Two weeks after the 10th anniversary of the terrorist assault on America in 2001, an objective observer – if such a person exists today – looking at relations between the Muslim lands in crisis and the developed Western and East Asian countries, might easily agree with those who describe the situation as a clash of civilizations. At the United Nations in New York, Palestinian Arab demands for recognition of a sovereign territory alongside Israel – the "two-state solution" that majorities among both Israelis and West Bank Arabs agree they want – were "self-sabotaged" by Palestinian rhetorical excess. An end to the Israel-Palestine controversy seemed further away than ever, with diplomacy serving as a masquerade for impotence. France, as a member of the UN Security Council, wriggled, supporting a Palestinian "non-member observer" seat at the UN. Israel remained calm, notwithstanding talk of a new mass political mobilization by the Palestinians and, in such a case, a tax blockade by the Jewish state, which collects revenues for the Palestinians. Meanwhile, as has become habitual at the UN, Iranian president Mahmoud Ahmadinejad disgraced his country, with the absurd allegation that the September 11, 2001 atrocities were falsified by the U.S. for the benefit of Israel. Away from the UN, in the countries of the once-so-promising Arab Spring, Libya appeared to consolidate its new government, even with ex-dictator Mu'ammar Al-Qadhdhafi still beyond the reach of the revolutionary authorities. In an illustrative but little-examined development, the deposed Libyan autocrat has chosen to convey his inflated and defiant speeches to the world through a television station, Al-Rai, located in Syria, within the jurisdiction of his fellow mass murderer Bashar Al-Assad. While Al-Qadhdhafi proclaims his disregard for world opinion, Al-Assad's army delivers the same message in bullets and artillery shells directed against his citizens. The Damascus regime appears serene as it pursues a policy of massacres. On September 23, Saudi Arabia once again illustrated its view of Yemen – a territory that elicited praise from the Prophet Muhammad – as a dumping ground for its problems. Riyadh had deported the Saudi cadres of Al-Qaida to its small southwestern neighbor, where the terrorist force organized itself as "Al-Qaida in the Arabian Peninsula" (AQAP). With the commencement of the Yemeni phase of the Arab Spring this year, AQAP occupied significant Yemeni territory and sowed jihadist confusion among the opponents of military dictator Ali Abdullah Saleh, ruler of Yemen since 1978. Saleh fled to Saudi Arabia after a failed assassination in June left him severely injured, but rejected efforts by the Saudis, other Arab states, and the U.S. to gain his approval of a transition away from power. It seems likely the Saudis then found his presence on their soil superfluous, and sent him back to Yemen. Following his return home, significant violence resumed, and dozens were killed in clashes between Saleh loyalists and opposition partisans. Yet far from the diversion offered by of these Arab and Iranian dramas, the unchanging problem of American relations with Pakistan persisted. And so it reappeared, with a sustained terror offensive by the Taliban and its Pakistani supporters. The campaign began on June 28, with an assault on the Hotel Intercontinental in Kabul, in which 20 people died. It continued on September 10, 2011, in a bombing at a NATO base in the eastern Afghan province of Wardak, injuring 77 U.S. soldiers and killing five Afghans. These incidents were followed on September 12-13 by the 19-hour siege of the U.S. Embassy in Kabul, where 27 were slain, including three terrorists. Then came the murder of Afghan ex-president Burhanuddin Rabbani on September 21. U.S. Navy Admiral Michael G. Mullen, whose assignment as Chairman of the U.S. Joint Chiefs of Staff will end on September 30, 2011, told the U.S. Senate Armed Services Committee on Thursday, September 22, what everyone in the Muslim world has known since General Zia ul-Haq seized power in Pakistan in 1977. That is, the Pakistani military, and its Inter-Services Intelligence (ISI) apparatus especially, are committed to aggressive local and global expansion of radical Islamist ideology. This engagement with jihad did not begin with the invasion of Afghanistan by the former Soviet Union, when Afghan mujahidin were assisted by the U.S. and Pakistan, recruiting additional combat personnel and preachers from Wahhabi Saudi Arabia. Nor did it end with the U.S.-led intervention to remove the Taliban from power in Kabul in 2001. There is a litany of misdeeds by Pakistan in this regard. I and my colleagues in the Centre for Islamic Pluralism have condemned this sequence of deceitful actions by Pakistan repeatedly, to a point where it is wearisome, however necessary, to again identify each of these episodes. We have been ignored, silenced, or met with expressions of helplessness. Adm. Mullen told the U.S. Congress that the terrorist network directed by Jalaluddin Haqqani, allied with the Taliban and responsible for the 2011 series of atrocities in Afghanistan, "acts as a veritable arm of Pakistan's Inter-Services Intelligence agency." This was followed by his reference in a press conference to the Haqqani network as a Pakistani "proxy." U.S. media opined that Adm. Mullen's forthright comments would aggravate tensions between the U.S. and Pakistan. But there is nothing new in disclosure of Pakistan's sponsorship of extremism, or of American awareness of it, or of tension between Islamabad and Washington because of it, or of the failure, so far, to identify a solution to it. The involvement of the ISI and Pakistani military with Islamist terrorism begins in Kashmir, the "rear-guard" for the South Asian jihadists. When the American-directed military response to September 11, 2001, brought about the overthrow of the Taliban, Al-Qaida and Taliban combatants withdrew into the remote Pakistan-Afghanistan frontier, and called on their auxiliaries in Pakistan and the region of Kashmir patrolled by Pakistani forces – epitomized by the notorious Lashkar-e-Taiba (LET or "Army of the Righteous") – for recruitment and aggressive action against the U.S., India, and other enemies of Muslim fundamentalist violence. The crimes of LET, although the group was trained and blooded in Kashmir, have not been limited to Kashmir. LET manipulated one of the first terrorist conspiracies disarticulated on American soil, the so-called "North Virginia paintball jihad," whose members were sent to prison beginning in 2003. LET was prominent in the 2006 conspiracy to sabotage Heathrow Airport in London. LET was named as the organizer of the massive 2008 raid on Mumbai. Such other extremist movements as the Jamaat-e-Islami (JI) founded by jihad theoretician Abu'l Ala Mawdudi have penetrated, and exercised differing degrees of dominance, over Pakistani diaspora communities in the UK and U.S. In Britain, where the majority of South Asian Muslims are followers of the moderate Barelvi tradition, they are opposed by the acolytes of the Taliban. The latter, driven by the fanatical, Wahhabi-style Deobandi school, fight for influence in mosques and schools, and have gained ascendancy over a minority of believers. In the U.S., where the Mawdudists of JI operate through a significant Muslim "community group," the Islamic Circle of North America (ICNA), Barelvis have been unable to create their own organization, according to Marcia Hermansen of Loyola University in Chicago, writing in the 2009 collection of essays, Sufis in Western Society. ICNA possesses numerous mosques in the U.S. In addition, Deobandi medresas function in several North American cities, Deobandis have established a Shariah Board of America in Chicago, and the Deobandi Tabligh-i-Jamaat (TJ) preaching movement proliferates among South Asian Muslims in Europe and America, as well as in India and Bangladesh. The Haqqani network nests in Pakistan's North Waziristan tribal region. While the Taliban, LET, and JI maintain their confrontational agenda against Western targets, they also murder Shia and Sufi Muslims, whom they label as apostates from Islam, in Afghanistan, Pakistan, and India. The ISI is complicit in all these activities. As in the Mumbai attack of 2008, evidence is present in mobile telephone records. None of this, to repeat, is new. Nor was it news to observers of Pakistan's Islamist subculture that Osama Bin Laden had been under apparent Pakistani military protection when he was eliminated by U.S. forces. Adm. Mullen enunciated a reality that American experts and politicians typically try to ignore. Confusion over Pakistan and its sponsorship of terror was exemplified by Texas governor Rick Perry's incoherent response, during the televised debate between Republican candidates for the U.S. presidency, on the evening of September 22. Perry was asked how he would react if, as President, he received a late-night telephone call informing him that Pakistani nuclear weapons had come under Taliban control – a very real concern. He replied, in part, "Well, obviously before you ever get to that point, you have to build a relationship in that region. That's one of the things that this administration has not done. Just yesterday, we found out through Admiral Mullen that Haqqani has been involved with, and that's a terrorist group, directly associated with the Pakistani country. To have a relationship with India, to make sure that India knows that they are an ally of the United States." But the reality of ISI involvement with the Haqqani network and other terrorists did not come to public attention only on the day of the candidates' debate, or the day before, and while India merits assurances of U.S. support against Islamist aggression, nuclear weapons in Taliban hands would conceivably accelerate terrorist threats on other continents, through Al-Qaida. His garbled comments revealed that Perry had little command of strategic issues in South Asia or the struggle against radical Islam. Pakistan has been impudent in its rejection of American reproaches about its tolerance for the proliferation of Islamist terrorists. Islamabad took great offense at the execution of Bin Laden on its soil, and intimated that its air force would have stopped the U.S. operation if informed of it before it took place. A large share of Western media treats Pakistani indignation at the U.S. resolution of the Bin Laden case as a legitimate complaint about violation of sovereignty. Pakistani foreign minister Hina Rabbani Khar responded to Adm. Mullen's statements by telling a Pakistan television channel, during last week's UN convocation, that America "cannot afford to alienate Pakistan; you cannot afford to alienate the Pakistani people." Yet the Pakistani people have already been alienated from America by Pakistani clerical, political, and military demagogues. Foreign minister Khar characterized Adm. Mullen's charges as "exceptionally hostile," and accused the U.S. of seeking to make Pakistan a scape-goat for the failures of U.S. policy in South Asia. She declared that Pakistan had laid down "red lines" the U.S. must not cross. These include a bar on U.S. troops' entry from Afghanistan into Pakistan in hot pursuit of terrorists. The Pakistani foreign minister also used the occasion of the UN General Assembly meeting to associate debate over Palestine with Islamabad's wish to extend its hegemony in Kashmir, according to the Pakistan Daily Times. In the most disturbing item yet reported, the London Guardian of September 22 stated that on September 8 U.S. General John Allen, as head of NATO forces in Afghanistan, conveyed an intelligence report of a truck-bomb conspiracy to Pakistani military chief Ashfaq Kayani, and that Kayani had remarked that he would "make a phone call" to prevent the attack. But no such communication was carried out. And the truck bomb then exploded at Wardak. At the UN last week, Pakistani foreign minister Khar argued, "We are part of the solution. We are not part of the problem. And if you continue to drive us in the other direction, unfortunately you will not only alienate the government of Pakistan, which is reaching out to you, which has been a worthy ally. I'm more concerned you will alienate the 180 million Pakistanis that your government always talks about reaching out to." Her tone embodied denial of the truth, which is that Pakistan has not reached out and has not been a worthy ally, and contempt for sincere U.S. efforts to assist Pakistan and her people. As described by the Los Angeles Times on September 23, Pakistani prime minister Yusuf Raza Gilani said the U.S. was responsible for repairing the U.S.-Pakistani alliance. "They can't live with us — they can't live without us," Gilani declared, in a statement of repellent cynicism. But America's Pakistani problem is not a matter of living, but of dying. Moderate Muslims, including Barelvi, other Sufi, and Shia Pakistanis, who have watched this long and scandalous comedy play out, have become exhausted and disillusioned. Pakistan is now, and has been for years, a leading terror-exporting state. Re-reporting the truth about this grim history will not ameliorate it. Nor will the Pakistani authorities address it vigorously. When U.S. representatives denounce Pakistani complicity with terrorism, such high officials receive no more attention than ordinary Muslim experts who point it out. It remains to be seen how far the U.S. is willing to go to eliminate this authentic threat.